If you currently do not have a DreamHost account, you can sign up at WordPress Hosting. During the signup process, request that a WordPress site be installed, then the option for the migration service will display allowing you to request it during signup. This article details the process of moving your WordPress site from your current host to DreamHost. If you're moving from WordPress.com then you'll have to follow their official directions: Moving from .com to self-hosted WordPress. But you may need to contact your current host for instructions on how to export in their system. Backup your database as a .sql file from your previous host. Backup your web files via FTP from your previous host. 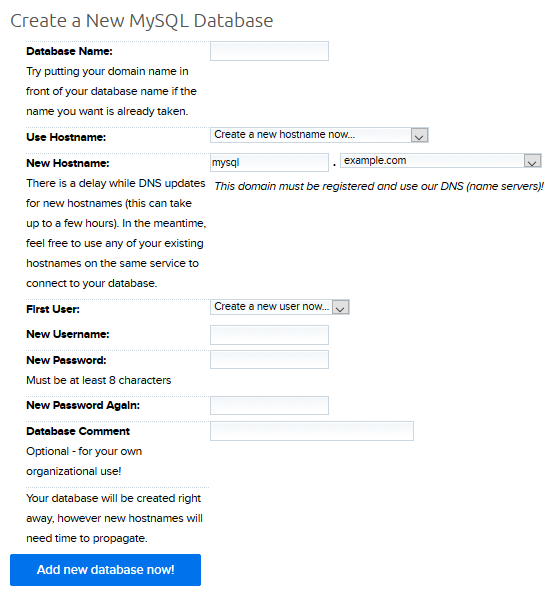 Create a MySQL hostname and database at DreamHost for the new installation. Upload these files via FTP/SFTP/SSH to your DreamHost server. Import your database to your DreamHost database server. 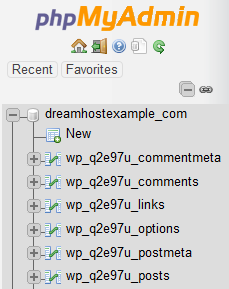 Update your wp-config.php file to point to your DreamHost database. Before you do anything else, back up your MySQL database at your current host. The method of creating a backup differs from host to host. The simplest method is to use phpMyAdmin, a web-based SQL manager available in many hosts' panels. For further information, check with your current host on how to backup your database as a .sql file. You may need to contact your current host to confirm what settings to use to connect to their server. Archive and compress your old WordPress installation at the current host before you proceed for quicker results. Contact your current host for instructions on how to do this. You can then upload the single file to your DreamHost server and log in via SSH to decompress it there. This is not necessary, but it may help to speed up the process if you have a large amount of data to transfer. Once you have the backup files saved to your computer, make a new MySQL hostname and a new, empty database for your WordPress installation in your DreamHost panel. You can create these on the MySQL Databases page. If you create the hostname and the database's name, user, and password information the same as your old hostname and database, you can avoid editing your wp_config.php file in step#5 below. Transfer your WordPress files you’ve backed up to your new DreamHost account. It's likely that the hostname, database, username and password that you created in your DreamHost panel differs from the one on your previous host. If that's the case you'll need to update your wp-config.php file to make sure that the information matches the login credentials for your new database in the DreamHost panel. Make sure that the table_prefix setting in wp-config.php matches your backup table prefix, otherwise WordPress will prompt you to install from scratch. To confirm the table prefix, use phpMyAdmin to log into the database at DreamHost you just imported in Step#4 above. Once logged in, click your database name on the left. You'll see the tables appear underneath. The first part of the table is the prefix. In the above example, the prefix is wp_q2e97u_. Update your wp-config.php file's prefix field to match this table prefix. If your DNS is not pointed to DreamHost, view the following article to view your site using a 'hosts' file. If the site appears as it should, you are ready to point your DNS to Dreamhost. Article last updated April 17, 2019 18:25 PST.